This is a favorite in our house! Ok I guess most of the recipes I share with you are favorites, I guess that's why I share.It's a healthier version of a comfort food classic. I leave out the cream and add swiss chard. I don't know what my kids would think if I made it any other way! I like the swiss chard because the flavor is rather mild compared to other greens and remember I have that over abundance kicking in my back yard, even if I didn't I will fill you in on my secret..There is no way I would leave the swiss chard out it just adds yumminess and makes it super filling. Soup it's what I've been making! 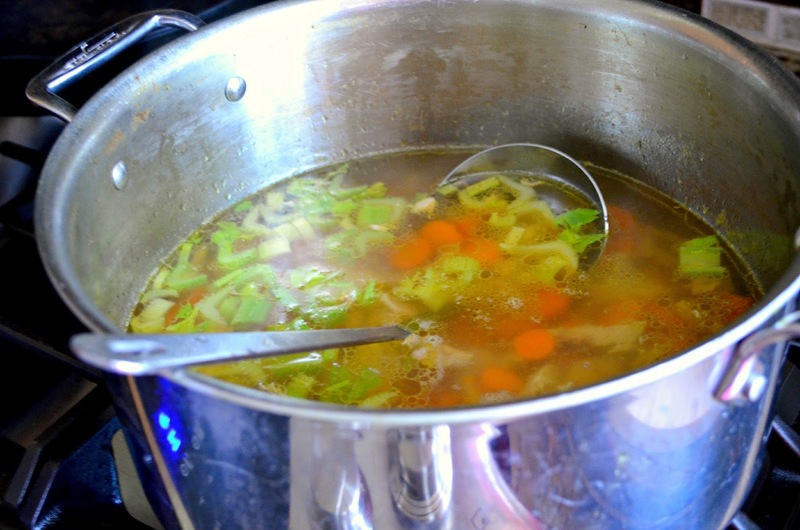 Add chicken stock, carrots and celery to a large stock pot and bring to a simmer. Allow to cook until carrots are tender about 20 minutes. Add chopped chicken. In a medium mixing bowl combine whole wheat pastry flour, unbleached all-purpose flour, baking powder, parmesan cheese, salt and pepper. Make a well in the center of the flour and add egg, milk and melted butter. Mix until fully combined. Drop by cookie scoop or tablespoon into simmering soup. Cover and simmer 20 minutes. All the dumplings should have risen to the top and be firm. Add chopped swiss chard and stir to wilt. Serve with a garnish of parmesan and enjoy. Chicken And Dumplings With Swiss Chard. A lightened version of a family classic. In a large stock pot add chicken stock, carrots and celery. Bring to a simmer turn heat to low and cover until carrots are tender about 20 minutes. Add chicken. In a medium size mixing bowl add flour, baking powder, parmesan cheese, sea salt and pepper. Make a well in the center of the flour mixture add the egg, milk and melted butter stir until dough pulls together and is moist. 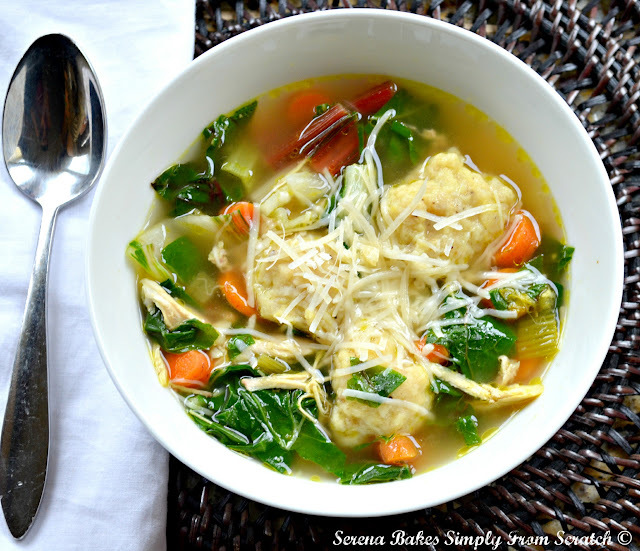 Drop dough into simmering stock by tablespoon size balls or by using a small cookie scoop. Cover soup and simmer on low for 20 minutes or until dumplings have risen to the top and are firm. Add chopped swiss chard and stir into soup until swiss chard wilts. Serve garnished with additional parmesan cheese. I have never had chicken and dumplings like this. This looks so flavorful and healthy! I like that you left out the cream, a lighter dish does have more appeal. Great recipe, glad I stopped in. Enjoy the weekend! I bet this one is so much better for me than the chicken and dumplings I usually eat. :) Hope you have a great holiday weekend! This looks completely amazing. I like how the dough has parmesan and I could totally control the carb portion for myself while DH gets as much as he wants! stop by sometime! Going to follow along. Serena...I love the way u tuk the pictures and made it so easy to follow. Great going dear. Yum! You just cannot beat soup with dumplings. Am a recent newcomer to swiss chard. I have to grow my own to get it here but love the texture it adds to soups like this. yum yum!!! this is definitely a must try !!!!! !loved it !!!! Hi Serena, your chicken dumpling look awesome. I'm sure it taste very good.